A Time For Waiting – I Am Not Ashamed Of The Gospel Of Christ! There are so many things we can wait for, some are very important while others are not worth the wait. As a Christian we wait on the Lord no matter what the cost, for only He can deliver us from our enemies and strengthen our heart. (Psalm 27:11-14). Teach me thy way, O Lord, and lead me in a plain path, because of mine enemies. Deliver me not over unto the will of mine enemies: for false witnesses are risen up against me, and such as breathe out cruelty. I had fainted, unless I had believed to see the goodness of the Lord in the land of the living. Wait on the Lord: be of good courage, and he shall strengthen thine heart: wait, I say, on the Lord. To wait for anything takes patience and even God who could in a split second change anything waited for Noah to prepare the ark before causing the rain to fall in the great flood. (Genesis 7:1-5) And the Lord said unto Noah, Come thou and all thy house into the ark; for thee have I seen righteous before me in this generation. Of every clean beast thou shalt take to thee by sevens, the male and his female: and of beasts that are not clean by two, the male and his female. Of fowls also of the air by sevens, the male and the female; to keep seed alive upon the face of all the earth. For yet seven days, and I will cause it to rain upon the earth forty days and forty nights; and every living substance that I have made will I destroy from off the face of the earth. And Noah did according unto all that the Lord commanded him……… (1 Peter 3:20). 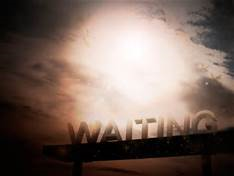 In our frailty at times waiting is not a top priority, and if someone wrongs us patience in waiting for justice to remedy the situation is the last thing on our mind, but to wait on the Lord for Him to take care of things is what’s asked of us as vengeance is His and not ours. (Romans 12:17-21) Recompense to no man evil for evil. Provide things honest in the sight of all men. If it be possible, as much as lieth in you, live peaceably with all men. Dearly beloved, avenge not yourselves, but rather give place unto wrath: for it is written, Vengeance is mine; I will repay, saith the Lord. Therefore if thine enemy hunger, feed him; if he thirst, give him drink: for in so doing thou shalt heap coals of fire on his head. Be not overcome of evil, but overcome evil with good…….. (Hebrews 10:30)……..(Proverbs 20:22). futuret…….. Thank you so much for the link you sent.It is just another way people are trying their best to look to everything but God for comfort and truth.God Bless You. Thanks for sharing. We have warned many times about witchcraft and the youth that are turning toward this. We must stay vigilant, and the churches must step up to the plate and educate our children.